Some fine bell barrows at the eastern end of the Cursus Group. View looking west. This is an impressive row of sixteen assorted barrows that form a line nearly a kilometre in length that starts close to the western end of the Stonehenge Cursus, passes through Fargo Plantation and ends in open fields about 700 metres northwest of Stonehenge itself. The slightly staggered linear cemetery follows an west-east alignment roughly parallel to the cursus with most of the barrows being about 120-150 metres south of the southern flank of the earthwork although one stands much closer and another pair including a rare disc barrow stand slightly further away. 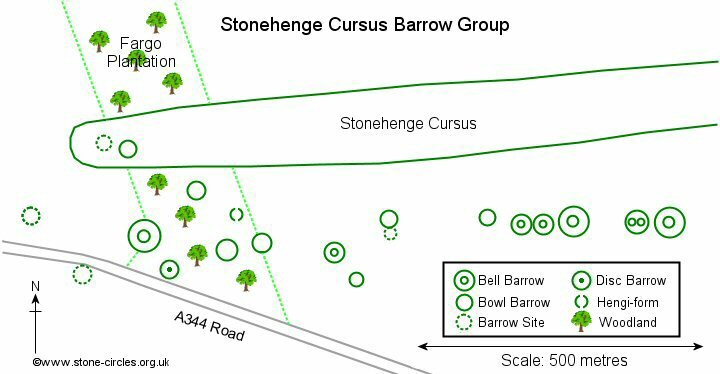 One barrow and a ring ditch are actually sited within the western end of the cursus itself but for some reason are not considered as part of this 'Cursus Group'. The barrows shown above are located at the eastern end of the row and are clearly visible from Stonehenge. 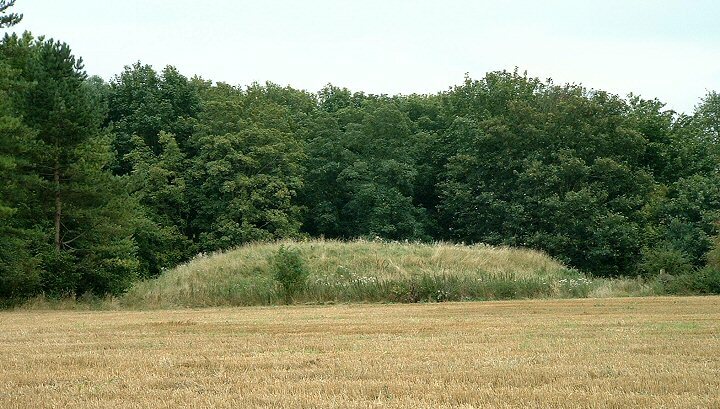 Closest to the camera is a large bell barrow (also shown inset) with its mound standing about 3.5 metres tall and measuring about 25 metres in diameter set within a wide berm and ditch that gives the whole monument an external diameter of nearly 60 metres. Just beyond it the lower mound is part of a double bell barrow set within an oval ditch of 42 metres by 33 metres, one mound measures 17 metres diameter by 2.5 metres tall, the other is slightly smaller at 15 metres diameter and 1.7 metres tall. Beyond this is a slight gap (above the brown calf on the left) followed by a further four barrows, a bell barrow is clearly visible while behind it a pair of bell barrows and a bowl barrow are largely obscured. Further west are another five bowl barrows, the previously mentioned disk barrow and a large bell barrow on the western edge of Fargo Plantation known as the Monarch of the Plain (shown below). Being so close to Stonehenge the barrows in this group have received much attention since at least the 18th century with antiquarian and later excavations uncovering both inhumations and cremation remains, as well as a range of grave goods including bronze daggers and awls, amber and faience beads, a flint dagger, beakers and urns. Intriguingly one mound was found to contain fragments of bluestone, presumably chippings from the same Welsh stones found within Stonehenge. The barrows all appear to be of Bronze Age date and are roughly contemporary with the final Phase III of building at Stonehenge although a hengi-form monument within the group may date to the late Neolithic. A large bell barrow at the western end of the group known as the Monarch of the Plain. Plan of the existing and destroyed barrows and features of the western end of the Stonehenge Cursus.